Professional tools METRINCH Archivy - CzechStar s.r.o. High quality industrial 1/2 in. sq. 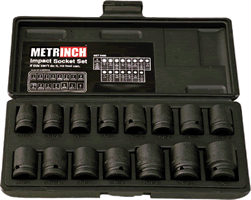 drive impact socket set, supplied complete in a black toughened blow moulded plastic case.